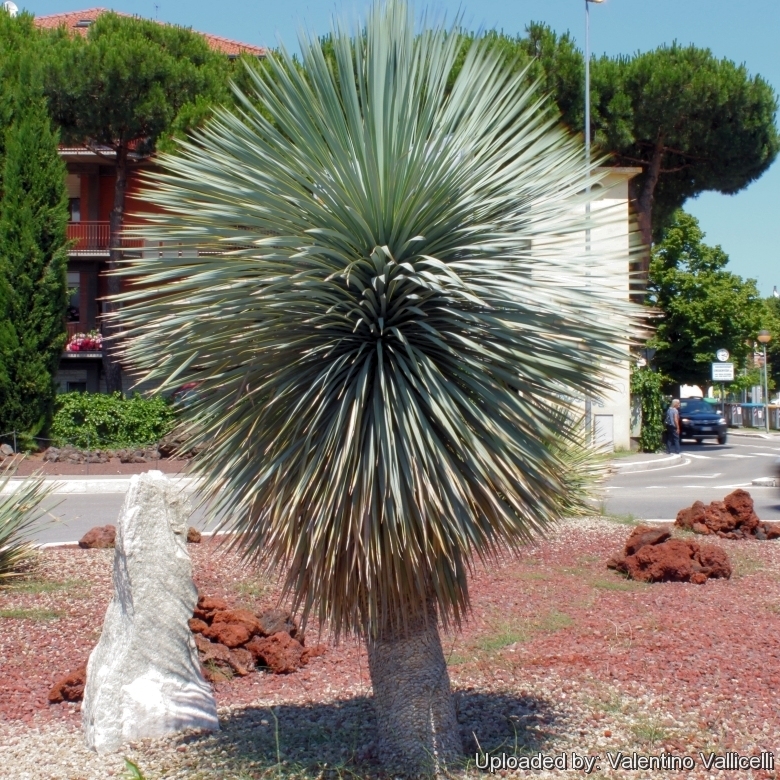 Photo taken at Cervia, Emilia Romagna, Italy. Origin and Habitat: South Western Texas ( Brewster Co. the Big Bend country) and northern Mexico (states of Chihuahua and Coahuila). Altitude range: 300-800 metres above sea level. Habit and ecology: Rocky slopes and ridges, canyons bottoms and plains. 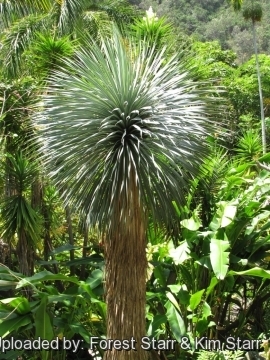 Yucca rostrata var. linearis Trel. 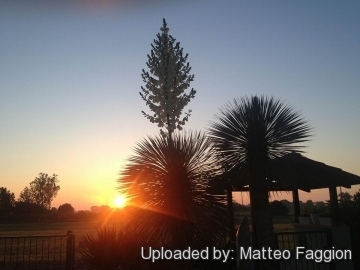 Description: Yucca rostrata (Beaked Yucca) is a slow-growing tree-like yucca with upright stems and beautiful shimmering topknot of slender grey-blue foliage. The leaf-margins are minutely toothed, translucent yellowish. Large clusters of white flowers bloom on yellow-orange coloured stalks that rise above the foliage on mature plants in late spring. The specific epithet 'rostrata' means "beaked" in reference to either the shape of the flower buds or appendages on the fruit. 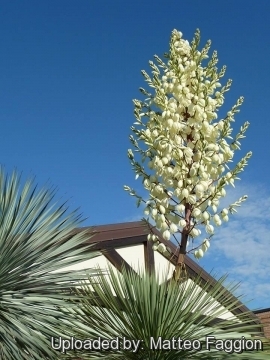 Yucca rostrata, particularly the larger plants, is perhaps the most handsome yucca. Habit: Stout plant, (1.8)2.5-3.5(4.5) m tall (without inflorescence). Although it can form up to three short branches, it is most often seen with a single trunk. The leaves form a dense frequently asymmetrical rosette made up of more than 100 leaves on top of the stems. Trunk: erect, simple The old leaves fall off leaving a fibrous soft grey covering on the trunk. Leaves: Stiffly flexible, more or less linear but widest well above the middle, flat to concave above, often keeled beneath, slightly waxy, bluish green to yellow-green, smooth on both faces often twisted; margins minutely toothed, lemon yellow, thin, and translucent. Blade 25-60 cm long, 12-17 mm broad. Terminal spine very pungent. Inflorescence: Ellipsoid to ovoid in outline, densely many-flowered, panicle-like, sparsely pubescent, (30-)60-100(-200) cm long. Scape 0.3 - 1 m long, part-inflorescences 28 - 40, to 38 cm long. Flowers: Pendent, globose to bell-shaped, 4-5 cm long, the parts not united. Tepals narrowly ovate, sharply acuminate, 42-52 mm long, 11-20 mm, white: Ovary 2-6 mm in diameter. Blooming season: Spring (in habit Mar.-May). Fruits (capsules): Erect, ovoid to ellipsoid, constricted, 3.5-7 cm long, 1.8 - 2.5 cm in diameter, becoming dry, durable, and dehiscent at the tip.. Tip with a conspicuous, slender and curved beak 2.5-4 cm long. In this yucca, fruits often very numerous (about 100). Similar species: Thompson Yucca (Yucca thompsoniana) is very similar, but is smaller on average and has rough-feeling, narrower leaves. 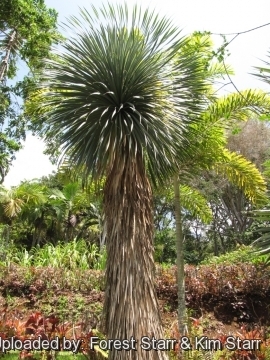 It is sometimes confused with Yucca rigida which has stiffer leaves that are more bowed in cross section compared to the flat leaves of Y. rostrata. Yucca rostrata Engelm. ex Trel. : larger-growing (3-3.5 m high) with larger inflorescences, longer and broader leaves with the widest part considerably above the middle, and smooth on both faces. Distribution: SW Texas and Mexico (Chihuahua and Coahuila). Yucca thompsoniana Trel. : smaller-growing (1-2 m high) with rough-feeling, smaller inflorescences, shorter and narrower leaves widest at or above the middle and somewhat scabrous on both faces. Distribution: Texas and N. Mexico (Chihuahua, Nuevo leon and Coahuila). 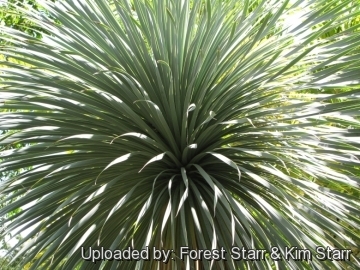 13) Forest & Kim Starr “Yucca rostrata (Beaked yucca)”. Plants of Hawaii. <http://www.starrenvironmental.com>. Web. 5 Jan. 2015. 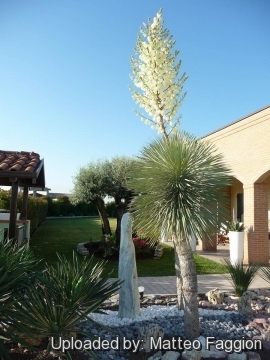 Cultivation and Propagation: Yucca rostrata is a slow growing, carefree and durable plant admired for its spherical form and fine texture and has become one of the most sought after of the woody lilies. 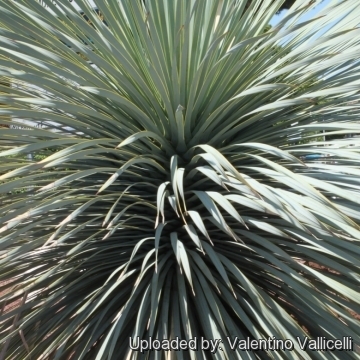 It is among the yucca species that form a trunk with age and won't be passed over by anyone with an appreciation for sculptural plants. This species is highly tolerant of drought, frost and heat. Though the tip of this plant is fairly sharp the lack of stiffness in the leaves makes this plant less dangerous than most others of the genus. Soil: Plant in very fast draining soil. It is adapted to a hot, dry environment, but has some tolerance to moisture and humidity when planted in a very well-draining soil. It is noted as preferring alkaline conditions. 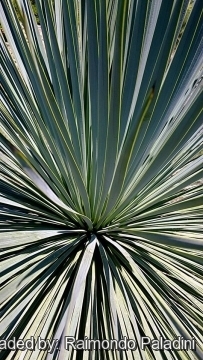 Uses: These make great specimen plants for xeriscape gardens and blend well in either tropical or arid gardens. Small plants are relatively inexpensive, but larger ones are a fortune. These make excellent potted specimens, and their symmetrical form provides a striking focal point, ans display wonderful shadows when illuminated by night lighting. In cooler climates they thrive well in gravel garden, as they have proven quite hardy because of the excellent drainage. Hardiness. Best where winter temperatures stay above 0° C, but is hardy to around -18° C. Plants in containers can be moved inside during longer cold spells. Maintenance: When the trunk is pruned of the older, lower leaves, the remaining leaf bases create a beautiful symmetrical spiral leaf-base pattern. Propagation: Easy to propagate from seeds or cuttings (If available).